Another day, another Spider-Man review. The latest piece of downloadable content for Insomniac Game’s superb Spider-Man, titled Turf Wars, is an unfortunately disappointing foray into the otherwise spectacular world that the developers have lovingly created. Riddled with tedious side activities, repetitive main missions and a story that is peculiarly lacklustre, ‘Turf Wars’ has many issues that bog down the base game’s usual high-octane action and irreverent fun. My review for the base game of Marvel’s Spider-Man discussed at length how much I adored the narrative within it. I expressed my love for the characters, the writing and the incredible world-building that Insomniac thrust into their game with all of the care and love that is necessary for adapting such a beloved character to another medium. This is why I receive no joy in saying that this particular piece of DLC is so tediously uneventful and lacking of all that made the original game such a wonder to play through. The narrative of this DLC sees our main man Spidey thrust into a violent conflict between two rival gangs, as the title suggests. As the previous DLC instalment hinted at, Hammerhead is now the big-bad that Spidey has to tackle, using all-new technology and weapons that pose an even greater threat to the Wall-Crawler. And that’s all there is to the story. The simple nature of the story isn’t necessarily a bad thing, plenty of games, movies and comics feature very little narrative. But it is what you do with the narrative that matters. Turf Wars is completely devoid of all that made the base game special. The writing holds very little weight with rather cheesy dialogue lines that make the game seem much more serious than it actually is. The tone of the writing is very far from the original game’s with characters acting completely different and choices that alter the game’s core thematic roots. I understand that Insomniac wish to give their more mature Peter Parker/ Spider-Man a more serious and adult-themed narrative, and I am incredibly pleased to see one of my favourite characters of all time experience the human-natured hardship that has been present in his comics for years, but this complete tonal shift is exceptionally jarring. To see Spidey crack a classically-unfunny one-liner in gameplay and then have him stumble around a bunch of police corpses in a cut-scene is a contrast that, unfortunately, does not hit its emotional mark whatsoever. Without spoiling the bare-bones narrative of the DLC, not that there is much to spoil, the ending once again teases the next instalment, Silver Linings (releasing in late December), and does so in a cliched and worn-out way that literally anyone will be able to see coming a mile off. The ending is the final nail in the coffin for this DLC’s narrative, emphasising the regrettably poor writing choices that the otherwise highly-capable and talented team decided upon. Alas, the issues with this DLC outing do not stop at the narrative. The gameplay additions to the game are also fairly lacking. I find it relatively difficult to criticise this DLC’s gameplay as it is the same adrenaline-fuelled, fast-paced, thoroughly-thrilling mechanics that I adored so much in the base game. However, the criticism for this DLC’s gameplay comes not from the mechanics so much as from the poor additions that Insomniac have included. It seems that Insomniac haven’t really listened to the initial reactions to their game from both fans and critics alike as side missions are still very, very lacking. Gang hideout missions are back, but this time they are re-titled and re-skinned to fit the Hammerhead gang theme, so if you enjoyed the base game’s hideout side missions then you will most likely enjoy these ones as besides enemy types and a noticeable difficulty increase, these missions are essentially unchanged and offer no real narrative incentive to complete them. My real gripe with this DLC’s side content is its inclusion of Screwball challenges…again. One of my only points of contention from the base game, and the first DLC instalment, was its fairly irritating side missions involving the “villain” Screwball. A very obscure Spider-Man villain, Screwball uses social media to ensnare Spider-Man into several challenges that eventually release captured innocents upon his completion of the trials. What really makes this already paper-thin plot even more unbearable is the character’s constant dialogue. 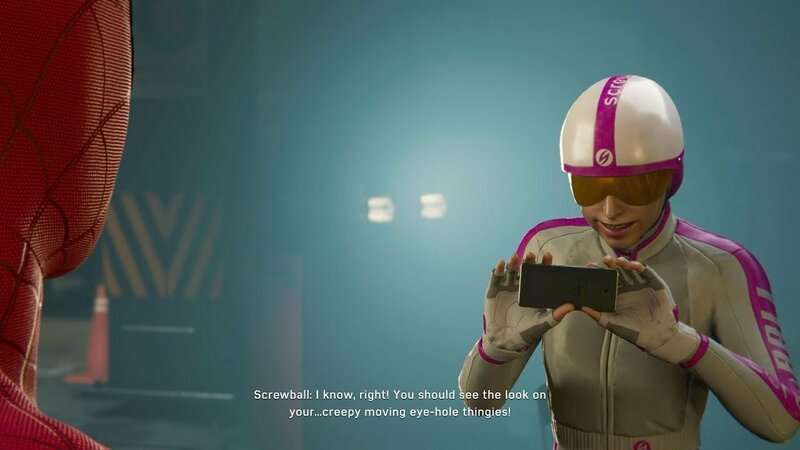 Screwball repeats the same intensely cringe-worthy one-liners throughout each of the challenges. And when you fail the challenge, her audio loop begins again. Due to the seemingly unfinished mechanics of these missions, you will be restarting them quite a bit. So get prepared to hear all about how many followers are watching you fail and how you deserve to dab in celebration of your efforts. To make matters even worse, it is heavily implied that these challenges will appear once again in the final piece of DLC, ensuring that the incessantly irritating voice will not be leaving my skull anytime soon. A final note of negativity; this DLC’s story lasted me all of 45 minutes. That is no exaggeration. The gameplay, minus some more lengthy cut-scenes, took under an hour to complete. I managed to 100% the DLC (finish the story, unlock all three suits and finish the side missions) in around an hour and a half, two hours at a stretch. The previous DLC instalment was also on the shorter side but I didn’t mind this as much as it payed very close attention to narrative and writing, bringing the same exceedingly-high levels of childish joy that the main game did via its intricately wonderful use of dialogue and characters. As previously mentioned, this DLC is completely without those charms, therefore making this short length (even with it being a tedious slog) a real kick in the teeth. If I had to praise one aspect of this paid piece of additional content for an otherwise excellent game, I would have to turn my attention to the aforementioned unlockable suits. It seems that each DLC instalment will bring with it three new suits. This DLC brings in a surprisingly varied selection; the Spider-Armour MKI, the comic version of the Iron Spider suit and the manga-inspired Spider-Clan suit. I must give particular praise to the Iron Spider and Spider-Clan suit as each of the fan-favourite suits looks incredible. The blue lights from the repulsor gauntlets on the Iron Spider suit looks simply divine and contrasts wonderfully with the striking red and gold design. The Spider-Clan suit has its own unique art-style attached to it, much like the vintage suit in the base game. The manga-inspired cell-shading works surprisingly well in the otherwise photo-realistic world, bringing a varied look to the game. Marvel’s Spider-Man: Turf Wars is a very personal, crushing disappointment to me. I despise the necessity to write anything negative about this otherwise exceptional game. A game that remains my personal favourite of the year. A feat that is not easily achieved, especially with the incredible competition this year. 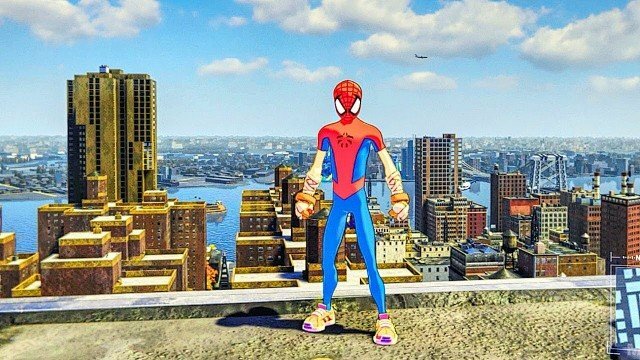 I hope that Silver Linings can bring back that unique Insomniac charm that made me fall in love with this game in the first place.